Find our long-range Baqueira - Beret snow forecast and weather report here. Check out expected conditions at the summit and base, including snowfall, temperatures and wind. Be sure to check our 8-day Baqueira - Beret snow forecast and weather report to stay up to date with the conditions at Baqueira - Beret this winter, especially if you're thinking of booking a last-minute ski holiday. 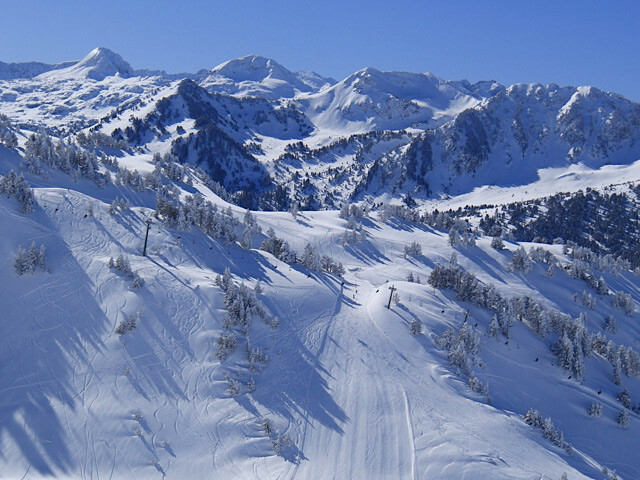 Get snow reports and powder alarms from Baqueira - Beret straight to your inbox! Fantastic in the morning and empty slopes getting very slushy after lunch. Massive snowfall last night into today - 35-45 cm! Not great visibility however. Snowed all night. Bluebird powder skiing all day. Hoping for more tomorrow. Icy today with spotty coverage. No snow on the horizon. Decent skiing when it warms up. Beret side is better. hasn't snowed for a few weeks, but 95% of runs still open, icy 1st thing then soft and heavy by lunchtime, but still plenty of fun to be had. Snow cannons working hard. No snowfall for 2 months and where there are no cannons cover is thin or bare.